In the holiday rush to make everyone happy, macaroni and cheese is the great unifier. And who could stay angry over political and religious debates at the table when a hot, bubbly casserole of creamy, cheesy pasta gets passed around? Baking dishes full of macaroni and cheese bless many eastern North Carolina Thanksgiving and Christmas tables, but does it belong between traditional roasted turkey, glazed ham and collard greens? Thirty-five percent of Southeastern households serve mac and cheese as a Thanksgiving side dish, 15 percent more than the rest of the country, opinion poll analysis website FiveThirtyEight found in 2015. That same year, half of the 1,000 people who responded to a Country Crock survey said they wanted to add macaroni and cheese to the holiday lineup. 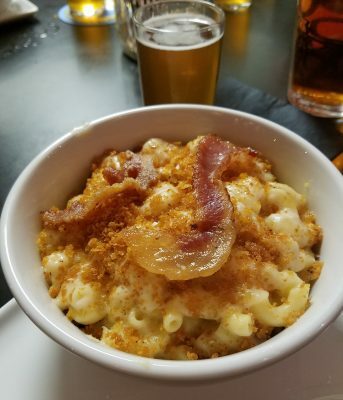 Thomas Jefferson put macaroni and cheese on the South’s radar. While traveling in Italy, he and his chef and slave James Hemmings encountered pasta mixed with grated parmesan cheese. Jefferson recorded copious notes on pasta making and brought the recipe back to Virginia. Soon after, Jefferson purchased a mold for making tube-shaped pasta. He also imported macaroni and parmesan cheese. In 1802, Congressman Manasseh Cutler of Massachusetts wrote of “a pie called macaroni” that he ate at one of then-President Jefferson’s White House state dinners. Jefferson and his fancy guests weren’t the only people eating mac and cheese. When Charlotte Observer food writer Kathleen Purvis noticed that more blacks than whites considered macaroni and cheese a necessary Thanksgiving dish, she decided to find out why. Macaroni and cheese long predates its American history. Around the 1300s, something called “de lasanis” in Italy meant pasta squares tossed with grated cheese, likely parmesan. A printed recipe calling for cheddar, béchamel sauce and macaroni showed up in the late 1700s in Britain. 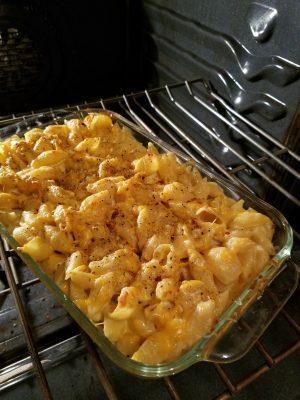 In 1824, America’s then-most-influential cookbook, “The Virginia Housewife” by Mary Randolph, included a macaroni and cheese recipe that instructed cooks to layer macaroni, cheese and butter in a pan and bake the combination in a hot oven. The recipe spread across the U.S. through the rest of the 19th century and into the 20th. Because macaroni and cheese is so decadently rich, fans forget that it has always been a cheap way to fill up on protein and carbohydrates, hence its wide appeal. Kraft sealed mac ‘n’ cheese’s fate as a low-dollar comfort food when the company introduced a convenient boxed macaroni and cheese kit in 1937. Suddenly, everybody was eating macaroni and cheese. Americans love boxed mac and cheese, but it can never match homemade versions. The best smothers sauce-grabbing elbow- or shell-shaped pasta in Mornay sauce made with sharp cheddar. The macaroni then gets layered with more shredded cheddar and crowned with a bread crumb crust that gets crispy brown during baking. That’s my opinion, anyway. I’ve met cooks who add egg yolks, swear by processed Velveeta “cheese” or doll up the dish with shrimp, crab or pulled pork. One chef I know likes to slide a sunny-side-up egg on top of brisket-enriched mac and cheese. For the Mornay sauce: Place a medium, heavy saucepan over medium-high heat. When the pan has heated, add butter. When butter has melted, remove pan from heat and add flour, stirring until well blended. Return pan to heat and cook flour, stirring constantly, for 30 seconds. Remove pan from heat again and whisk in half of the milk. Return pan to the heat and whisk in remaining milk. Drop bay leaf, clove and garlic to the mixture. Bring sauce to a boil, stirring constantly. Reduce heat and simmer until sauce has thickened, stirring often. Whisk in mustard, salt and pepper. Remove pan from heat. Stir ½ cup of sharp cheddar into sauce until melted. Taste sauce for seasoning, adding more salt, mustard or cheese to taste. Mix cooked pasta with Mornay sauce. Pour half of the pasta into a large casserole dish. Top with 1 cup of grated sharp cheddar cheese. Place remaining pasta in the baking dish. Top with remaining 1 cup sharp cheddar cheese. Sprinkle bread crumbs over casserole. Bake for 15 minutes or until casserole is bubbly.